PhabrOmeter® Data can be used for quality control of existing products or performance prediction of new products, both qualitatively and quantitatively. The measured data provides a solid base to set price for high-end products to achieve added value and profits; and eliminate disputes in trading on assessment of product quality. Meanwhile through such instrument measurement to achieve an objective evaluation, industries are now better positioned to further improve their product quality. One of the well-known fabric suppliers in China uses PhabrOmeter ® to guide their development of new product - "ecological sanding" series for autumn and winter. Through comparison of PhabrOmeter data between new product and traditional product, they successfully convinced the clients and achieved a historically high order and sales in 2016! the larger smoothness value, the smoother sample. 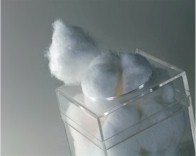 Conclusion: Tencel is softer than Cotton; Tencel is more washable than Cotton. A large chemical group in China has saved hundreds of thousands dollars each year after they adopted PhabrOmeter ® as their daily measurement tool in monitoring the stiffness of their luggage fabrics - prior to use PhabrOmeter, they count on worker's experience to estimate the amount of stiffener usage, workers thought the more is better and they used to use up to 300g/L for each treatment. However, PhabrOmeter® test reveals that once the amount of stiffener reaches 120g/L or more, the luggage fabrics resilience value levels off, meaning 120g/L is the optimal amount for their luggage fabrics treatments. Since then, this company has been using PhabrOmeter scientific data in all stages to inspect the product quality. 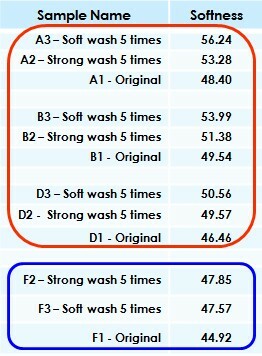 PhabrOmeter® Data sample 5 - How to select washing machine settings? 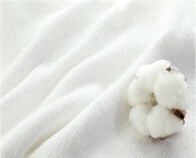 For 50%Wool + 50%Polyester fabric using Either Strong wash or Soft wash makes no significant difference. Conclusion: Select Soft Wash for pure wool or wool blend (80% or higher) fabric results in better fabric hand. Relative Hand Value (RHV) - Against a reference fabric, an overall fabric performance ranking of a set of fabric samples tested. Drape Coefficient (DC) - The extraction test is in fact a forced drape so it should be able to describe the fabric dynamic drape behavior. The test results can be used for drape test and comparison. Wrinkle Recovery Rate (WRR) - The difference between two repeat measurements of a given fabric sample after a given time duration will give you the wrinkle recovery information. RESILIENCE - A larger resilience value - a resilience fabric. SMOOTHNESS - A larger smoothness value - a smoother fabric. * In our most recent released version of software, for the purpose of easy reading, the softness index has been scale to the same trend as the other two attributes: the larger value, the stronger characteristic.